Home > Football > Fleetwood book Wembley date at the expense of York? The biggest crowd of the season at Highbury turned out to watch Fleetwood reach the league two play-off final after holding York to a 0-0 draw on the night which sees the Cod Army through 1-0 on aggregate. York pushed hard for the all important goal however Fleetwood just about deserved to get through and keep alive their hopes of a sixth promotion in ten seasons in what has been an impressive rise through the leagues. Fleetwood reached the league two play-off final after deservedly winning on aggregate on a fine evening for the north-west club. The Cod Army will go onto play either Southend or Burton at Wembley to battle it out for a place in league one. On the night Fleetwood found themselves defending for much of it but in the second half created the better of the chances and could easily have won the match. 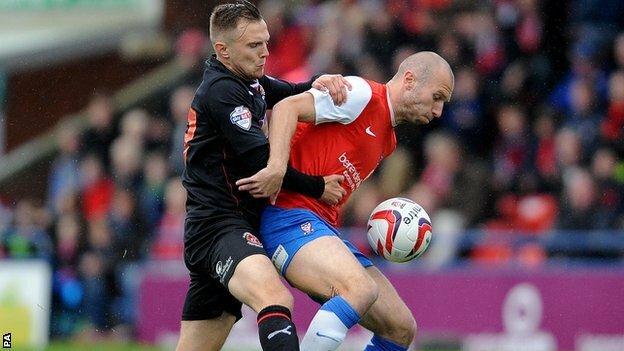 York put plenty of pressure on the Fleetwood defence but they held firm on what was a great day for all of Fleetwood. York started the first half much the brighter team with plenty of attacking intent looking for that goal which would level the scores on aggregate. It was however Fleetwood who had the first and arguably best chance of the half when on loan Blackburn Rovers midfielder Josh Morris fired over from just inside the penalty area after a swift counter attack led by Morris himself. Schumacher, resulting in a Ian Hume effort sailing over the bar from a Morris cross when he should have found the target. York’s only attempt on target in the first period came when good work from Calvin Andrew set up a chance from 20 yards for winger Michael Coulson bringing a good save out of Maxwell in the Fleetwood goal. Fleetwood ended the first half the stronger of the two teams and had plenty more possession but York would have been the happier of the two going into the break having done more with the ball than the Cod Army. York came out for the second half with lots of attacking threat trying to find the breakthrough knowing the first goal would be hugely significant. The first real chance of the half came for Fleetwood’s Josh Morris who after good link up play with Antoni Sarvecic scuffed his shot just wide of the York City goal when he really should have done better. Sarvecic then created a chance for himself brilliantly going past two City players before firing a shot in low which was kept out well by on loan Charlton goalkeeper Nick Pope turning the ball wide of his right hand post. With 10 minutes to play Calvin Andrew had an effort from 30 yards which went a whisker over the crossbar with Maxwell standing no chance. York continued the pressure and had further efforts both from Ryan Jarvis which failed to find the target. Then as York desperately threw everyone forward including keeper Pope a golden chance to win it for Fleetwood fell to Morris after he found himself one on one with Pope who stood up well and the danger was eventually cleared. However, York couldn’t find that important goal and Fleetwood advanced to the final to the delight of their fans who will be going to Wembley on the 26th May. Both managers paid tributes to their teams for the way they have played not only over the two legs but over the whole season and one which will hopefully go down in history for the Cod Army.